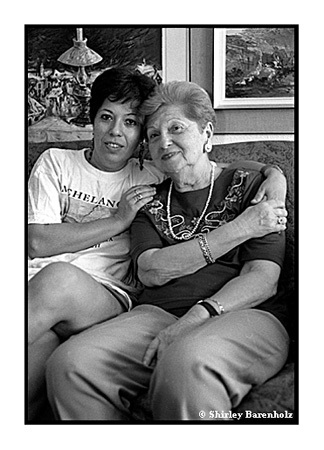 Margalit (Mimi) Artzi-Liquornik was born on October 5th 1921 in Suceava, Rumania. She was the only child in the religious family Liquornik that was living on the income of a small farinaceous food store. When her parents were deported to Transnistria by the Rumanian government, Margalit fled to Nagivarod in North-Transylvania, an area between Rumania and Hungary, where almost for three years she taught English, Hebrew and German at a girl’s boarding school. In March 1944 the Nazis took over the regime in Transylvania from the Hungarians. Short after Margalit tried in vain to cross the border with Rumania. She got caught and together with hundreds of other Hungarian companions in distress, deported to Auschwitz, where she arrived in May 1944. Six months later, as the Germans closed down the `C-Lager', Margalit was transferred to Klein-Schönau, a satellite work camp of the notorious concentration camp Gross-Rossen nearby the German-Polish boarder. She was put to work in the factory that was producing parts for airplanes. On May 8th the Red Army liberated the camp. Not knowing if her family was still alive, Margalit, as lean as a rake, started three days later on her long journey back home. After six weeks she reached the Rumanian border. From the twenty women that had left the camp together, only three had survived. In a Displaced Persons camp Margalit saw the note from her father hanging on the wall. He was already looking for her for weeks. Soon after Margalit could enclose both of her parents in her arms again. But grandparents, aunts, uncles and cousins were killed. Margalit stayed another year in Suceava and married in 1946 with Itzhak Artzi, who she already had met in Chernowitz in the beginning of the war. On their wedding night they started their illegal journey to Palestine, which would take them a year. In the Yugoslavian port-city Bakar Margalit and Itzhak boarded in November 1946, together with four thousand other survivors, on the ship `Knesseth Israel'. It was spotted by the English blockade-ships. Those on board where brought to the internment camp on Cyprus. Only nine months later, in October 1947, the Artzis could set foot on the shore of the 'Promised Land'. A year later they were part of the establishment of the kibbutz 'Aloney Aba' in the Valley of Jezreel, in the North of the country. Now the Artzis live in Tel Aviv. They have two children and six grandchildren. Nava Semel-Artzi was born in Tel Aviv on September 15th 1954. She and her five-year older brother grew up with traditional-Jewish values in a left-intellectual environment, in which their parents circled. Already at a young age Nava wanted to become a writer. After high school she served in the army as a news-producer with 'Gale Zahal', the army radio. During her study Art-History at the University of Tel Aviv, Nava also worked as a producer at the television and as a journalist writer. In September 1976 she married Noam, who she had met a year before during one of the performances of her brother who is a well-known singer. Three years later their first son was born. Because of a job-offer Noam got as general-director of the Haifa Municipal Theatre the Semels moved in 1980 to Haifa, where they lived for nine years. After that they moved for four years to New York, where Noam became the Consul of Cultural Affairs. In 1990, still in New York, Nava gave birth to twins. Two years later the five-headed family returned to Israel. They now live in Ramat-Gan, a suburb of Tel Aviv. Nava has built up an impressive literary career. She published eight successful books, wrote film scripts, librettos, radio-dramas, children books and short stories. A lot of her work is translated and she has received prestigious prices and rewards in Israel and abroad. Margalit is widow since September 2003. She now lives in a retirement home in Tel Aviv and has six grandchildren and four great-grandchildren. Nava moved with her family to Tel Aviv in 2004. She still writes and publishes frequently in Israel and abroad. (See also the documentary ‘open Eye – open I’).